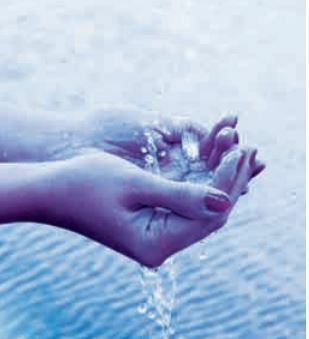 Water is one of most highly controlled resources. Nevertheless, there are relatively high tolerance levels for lime which endanger technical facilities and cause destruction. In comparison to mineral water, drinking water has extremely low calcium content, although it is enough to cause problems. There are different systems to remove and prevent lime deposits for residences. Through the addition of chemicals it is possible to treat and filter out the lime, this can lead to high maintenance costs. Beside these systems there are physical water treatments whose function is argumentative to this day, these water treatments are rock crystal, with the explanation that these would work on the water if they are mounted on the exterior surface of the pipe. Our belief does not go so far. We are convinced that a purely electronic-physical water treatment system is the ideal option; we have carried out many in-house tests which have confirmed this belief. We have developed a new device from these results. 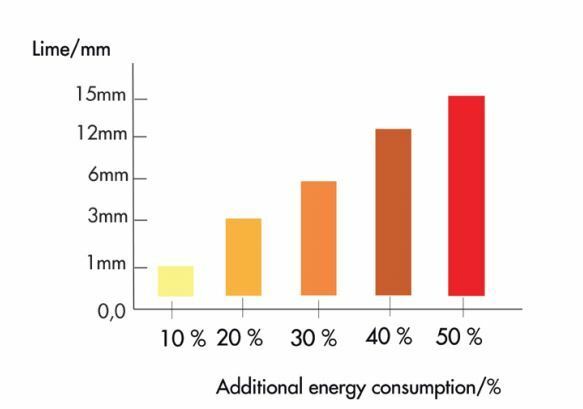 Furred heating rods use more energy, because the warm transference can occur only through the lime layer. The following table explains the connections. Water differs from other molecules particularly by the fact that water molecules are not neutral but polarized. Water molecules are also known as dipoles. Representation of a calcium hydrogen carbonate molecules with stored water molecules. Crystals, like calcium carbonate, are inclined to take in water. One can imagine figuratively in such a way that within the crystal, water molecules are stored. Such a crystal has different shapes, however, is form-stable; just the position of the water storage changes. 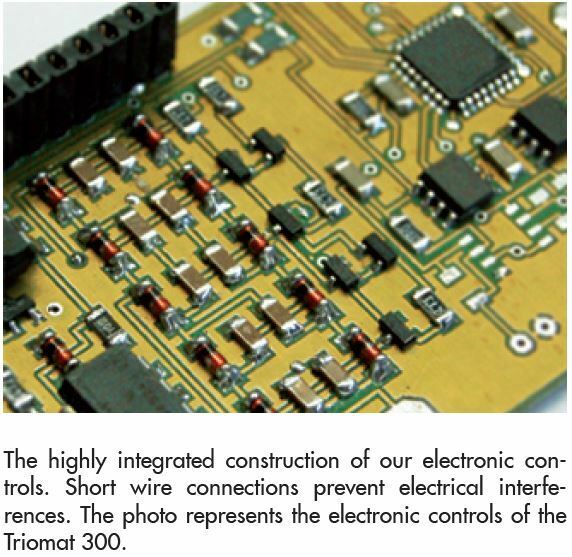 Our Triomat appliance generates an electrostatic field. 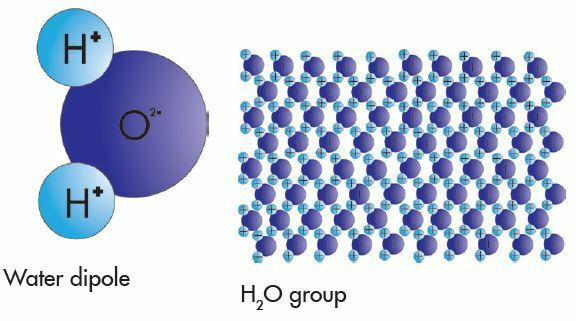 Going through or in the crystal group the available water molecules which also have molecular polarisation are spontaneously influenced to change molecular structure. From the disturbed balance calcium carbonate escapes, namely in an amorphous (shapeless) structure which is dissolvable in the water and is rinsed from the system. The released carbonic acid reacts again with mature lime and forms the above mentioned balance once more. However, this cannot be maintained on account of small quantities of carbonic acid which remains. Once again carbonate is rinsed out. We have no components that magically remove molecules, that just is not possible. In contrast to other manufacturers of similar systems we generate 48 volts of impulses; in our industrial devices more than 100 volts. Almost all our devices can recognise the water flow and thereby switch automatically between impulse and normal functions. By the application of at least 3 resonans coils, even by our smallest device, we reach a very wide active field on the water pipes. In the apparatuses with 4 active reels we use not only a sweeper impulse with which a low frequency outgoing a rise occurs up to the maximum frequency and back, but at the same time we scan with every impulse the signal of a reel to the next - a procedure which is very unusual and very effective. The specific feature of our larger apparatuses is the blue background with white text exactly describes the respective operation status, it is user-friendly and service is carried out with 2 or 3 keys. Once a program is stored it is retained even after a power outage. We have produced such devices since 1992 and, in this time have gained knowledge and experience; with today‘s microprocessor technology it is possible to generate much more intensive active impulses. We now change not only the frequency response of the signals, but virtually walk with our impulse on the whole wrapped pipe. We also know how important it is that the devices are not permanently in operation, this is why our system switches itself off automatically at regular intervals. With our Triomat 300 this occurs by programming. With the larger models an interval time dependent on flow is calculated because these models are able to recognize the water flow, thereby adapting the operation intervals optimally. All devices generate 48 volt impulses which produce an equivalently strong field. Once a program is stored it is retained even after a power outage, the device starts again with the stored program. 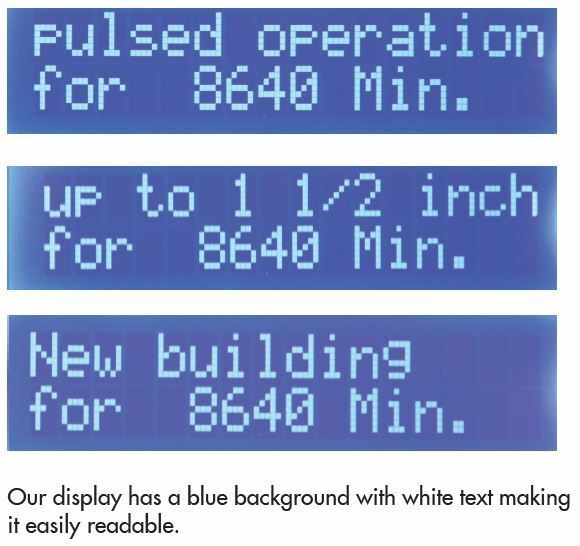 Our devices beginning with Triomat 300 have a clear text announcement which explains the respective working program including the remaining runtime of the respective program. The programming is accomplished with a simple understandable dialogue with the Menu and Enter keys. 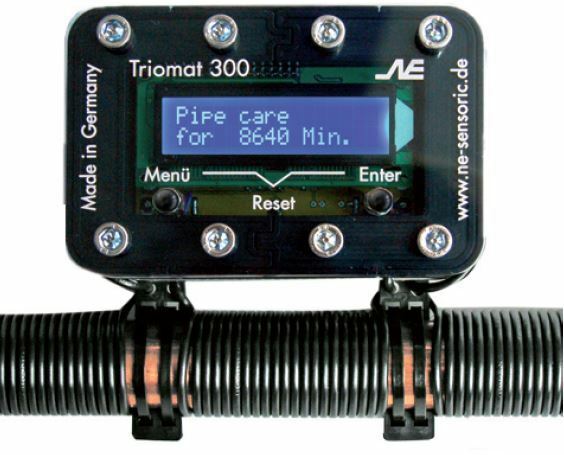 The devices beginning with the Triomat 400 have, in addition, supervises temperature which timely warns about frost danger and therefore helps to prevent the freezing of pipelines. In this case the device emits an acoustic signal and announces the warning in clear text on the display. 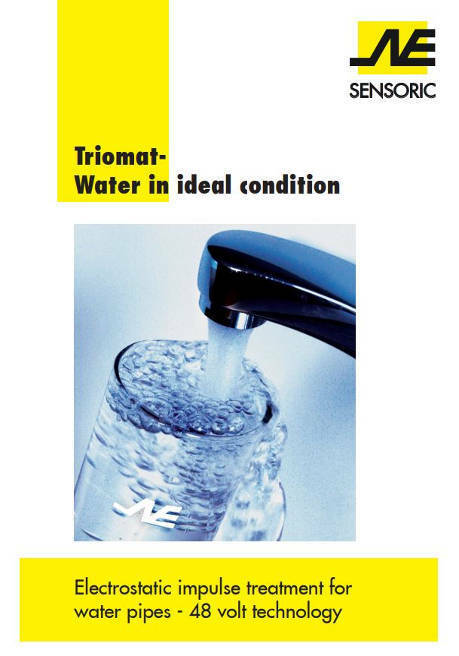 Beginning with Triomat 400 we also work with a flow sensor which recognizes if water is removed from the system, using it to control between the cycles impulse and normal operation. The water flow is also shown on the display. So as not to use energy needlessly, the display switches itself off with all Triomat devices after 5 minutes if no key inputs occur, by pressing one of the keys the display is switched back on. We are the only manufacturer of such systems which supervise at the same time the water flow and determine in this manner by which the interval between impulse and normal operation is changed. In this respect this is very important, because we thereby have a resting phase where the water is not treated electro statically and allows for normal deposit build-up. As already described, we need such deposits of carbonic acid. If the device is permanently run, i.e. with set timing, it isn’t able to determine the optimum relation between lengths of treatment (impulse operation) and resting phase (normal operation). The water flow changes the given program structure. This dynamic adaptation is called adaptive regulation it is recorded with the microprocessor setting a suitable working parameter for the device. An optimum working parameter is achieved without manual intervention. The most frequently asked question is regarding the installation of the devices in that as the resonance coils must be wrapped around the pipe, what if not enough free pipe area exists. We have performed in the following diagrams some examples how the installation in these cases can be achieved. 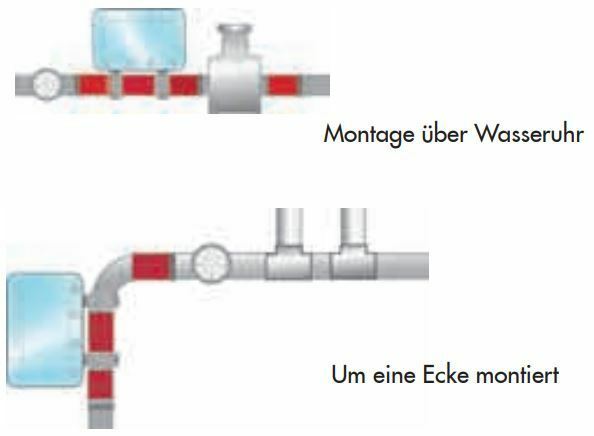 Our devices have a strong field current, so that it can easily be mounted on bended pipes as well as pipes with interruptions, such as shut off valves. Each wire should be wound around the pipe a minimum of 20 times, direction is not important, but for optical reasons all wires should be wound in the same direction. On account of the high 48 volt voltage output we do not differentiate between plastic and metal pipes as other manufacturers do, the manufacturers of these devices often only change the frequency which is just nonsense. Our impulse has a high enough voltage output that we can avoid this differentiation. Our microprocessor technology could easily technically insert additional parameters which could have been superfluous. 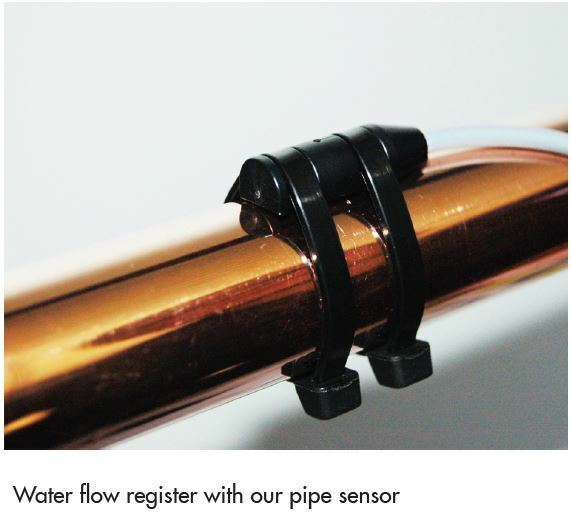 All our devices can also be used with soft water, since a long term a hardening of the pipe system can take place. While external armatures from calcifying is not a problem for customers with soft water, but protecting the inner pipe walls from lasting lime build-up is. switched only seldom to normal mode.